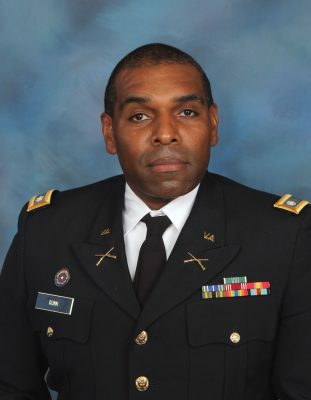 LTC Gunn graduated from Waynesboro High in 1991 and after a year of working in the community, enlisted in the U. S. Army in February 1992. Alec completed his basic training at Fort Leonard Wood in Missouri. He then was sent to Fort Sam Houston to be trained in combat medicine as a Medical Specialist. During this time he worked in the Troop Medical Clinic where he assisted and treated active duty soldiers, seamen, and Marines in the area. He, then, moved to the hospital and worked in the emergency room. Upon his fourth year in the Army, Alec re-enlisted to attend Physical Therapy Specialist School at the U.S. Army Academy of Health Sciences. This was a five-month course with instruction in Biology, Anatomy and Physiology. Once Alec completed this course and graduated, he took charge of a small physical therapy clinic. While stationed in Germany, he was allowed by his command to participate in the German-American Football League where he played special teams and linebacker for the Asschafenburg Stallions. Upon graduating from the 7th Army Noncommissioned Officer Academy Primary Leadership Development Course in 1998, Alec moved from his original medical specialist job to working as an agent for the local Criminal Investigation Command (CID). During his time with the CID, Alec conducted crime surveys and investigative tasks, investigated felony violations of the uniform code of military justice, conducted surveillance on narcotics and economic crimes, conducted interviews of witnesses and suspects, conducted crime prevention and counter-terrorism surveys, and undercover purchasing of controlled substances as a member of a Drug Suppression Team. In January 2000, Gunn left the Army. While working as a physical therapy assistant and personal trainer, Alec meets his future wife Tracy Morris. He then attended Blue Ridge Community College in transit to James Madison University. On June 21, 2003 Alec and Tracy married; Alec immediately becomes the step-father of two wonderful and amazing boys Joshua and Jordan. While attending JMU, Alec was employed by Fishburne Military as Assistant Athletic Director and the head football coach; although, he did coach other sports such as baseball, JV basketball, wrestling, and track & field. Alec graduated from JMU and sought a coaching job at the collegiate level. This did not pan out and he took a job at his old middle school- Kate Collins. Alec taught Physical Education to 6th and 7th grade students and was the instructor for an 8th grade JROTC class. After three years of teaching these subjects as well as coaching, Alec was named the middle school Athletic Director. Alec completed his continuing education courses, coached and maintained the athletic program for 2 years. After which he was named the Commandant of Fishburne Military School and thus is back home again.